I had a fun day but I hate that it's the last day of my favorite season here in Oklahoma. That's a mess of tree rats! Congrats on the fox squirrels. We have them here but only in pockets... Usually swampy areas . Very nice! Sure do love me some squirrel and dumplings! Wish I had gotten the two bushy tails that were raiding one of our corn feeders. Both were the size of a small house cat. Nice mess of squirrels. Congrats!! Congrats on the Squirrels Gordon. You must have a recipe for them mine always come out tough. Caleb, regardless of the recipe, my wife usually pressure cooks them about twenty minutes first especially when we fry them. 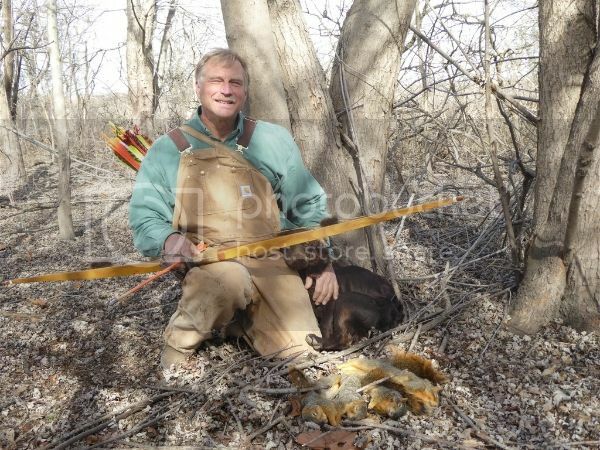 That's my kind of bow hunting! awesome job bagging all those squirrels. You are one bad dude with a stick bow! Thats a lot of successful shots on little targets that are tough as nails! nice pic, looks like fun!